Edible wild plants, mushrooms, fruits, and nuts grow along roadsides, amid country fields, and in urban parks. All manner of leafy greens, mushrooms, and herbs that command hefty prices at the market are bountiful outdoors and free for the taking. But to enjoy them, one must know when to harvest and how to recognize, prepare, and eat them. 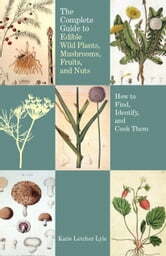 The Complete Guide to Edible Wild Plants, Mushrooms, Fruits, and Nuts provides everything one needs to know about the most commonly found wild foods—going beyond a field guide’s basic description to provide folklore and mouth-watering recipes for each entry, such as wild asparagus pizza, fiddlehead soup, blackberry mousse, and elderberry pie. This fully illustrated guide is the perfect companion for hikers, campers, and anyone who enjoys eating the good food of the earth. With it in hand, nature lovers will never take another hike without casting their eyes about with dinner in mind.